Have fun making this soda cap bottle magnet, and feel good about recycling as well. Once you have finished the flower design, perhaps you might try a Christmas tree shape or a school bus, as shown below, or perhaps you can think of another design of your own. If you have bottle caps in the right colors, this project will be very simple to put together. However, if you don’t have the right colors, you can use craft paint to paint the bottle caps in the colors that you need. Start with one yellow cap and glue six red caps around it, then take two green caps and glue them to the ends of the flower caps as leaves. Let dry. On the yellow cap, glue on tiny goggle eyes, or draw on some eyes with black permanent marker. Draw on a smile with red permanent marker. 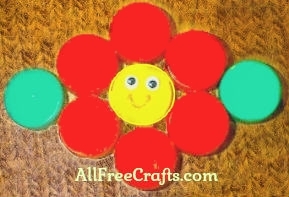 Now place the smiley bottle cap flower onto a piece of felt. Trace around the flower shape and cut out this shape from the felt, cutting just inside the traced line. Glue the felt flower shape to the back of the bottle caps. When the felt is firmly glued and dry, attach a magnet to the back of the flower with glue. Place on the fridge with a new drawing that you have created. Enjoy!